Russian atmospheric black metal band Чёрные Озёра (Chernye Ozera = Black Lakes) has just released its newest work “Хандра“, which means “Blue“. The band was formed in 2008 and had many releases all these years, including 5 full-length albums, most of them in CD-R editions, 2 EPs and 3 split albums. In its first works the band had a more underground raw pagan black metal approach in their music. “Хандра” is the sixth full-length album of Чёрные Озёра and it is released by Deleting Souls Records, another Nihil Art Records division. This album is very different from their previous releases and I see it as a new beginning for Чёрные Озёра! It is by far the most ambitious, complete and professional work of the band, with an impressively improved sound and production. 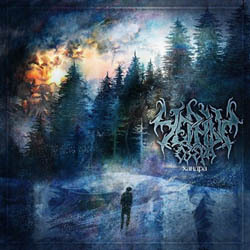 Fans of melodic atmospheric emotional black metal better check this album, you might be impressed! “Хандра” is released by Deleting Souls Records in a standard jewel case edition with 4-page booklet and wonderful artwork, illustrated by Владимир Прокофьев (Paint it black design). You can visit their official VK profile below for more info and their label’s Bandcamp for sound samples.